In order to celebrate women’s suffrage centennials, we need an appreciative audience. This is best accomplished with an informed and educated public. But not until relatively recently has the history of all the people, not just military and political figures, been the focus of history instruction. Jason Nord, a teacher in Nebraska who has taken on this challenge, is close to the end of a Kickstarter campaign to fund the publication of a book for young people ages 9-12 years about the women who picketed the White House in 1917. Nord says that he loves to teach American history in such a way that excites his students, and this happened when he told them about the National Woman’s Party, a group of suffragists that protested outside of the gates of the White House in 1917. For the most part, he says the struggle for votes for women has been taught in the following way: There was a problem with equal rights. It was fixed with the ratification of the 19th Amendment to the U.S. Constitution in 1920 that guaranteed American women voting rights. Case closed, and now we don’t have to think about it anymore. “I enjoy digging into history in a way that’s not normally told,” Jason Nord said. “It can be odd, controversial, and it gets kids thinking in a wide direction. When I told them about the White House protest, the students were spellbound. They wanted to do research and take action. I was frustrated over the lack of resources for young people to learn.” When he presents the real story, Nord said students are fascinated. 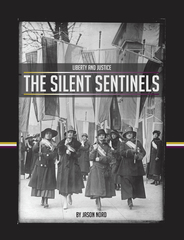 And thus the Silent Sentinels book, the first of a series of a press he founded, Equality Press, that will tell stories of equality and justice for a young audience. An extra perk for the book is the story of 12-year-old Serena Kearns, the youngest Silent Sentinel on the picket lines in 1917. Her story will be told by Jason Nord at book signings and events promoting the book although Serena’s participation didn’t come to Jason’s attention until after the Silent Sentinels book was well into production. A narrative about a young person who picketed the White House will make the book immediate and relevant for young people, Nord believes. The story of Serena Kearns and her family in the movement for votes for women is being told on the “Spirit of 1776” suffrage storytelling series (SuffrageWagon.org). The year 2017, the centennial of the picketing of the White House, means that now isn’t too soon to be planning for this observance. Says Nord, “Equality Press was founded on the idea that education can help us to create a more just and peaceful world.” The Silent Sentinels book is scheduled for distribution in December 2015. TO ORDER & FOR KICKSTARTER INFORMATION. This entry was posted on September 13, 2015, in Blog and tagged 2017 suffrage centennial, National Woman's Party, Silent Sentinels, suffrage centennial, suffrage history, Votes for Women, womens suffrage.